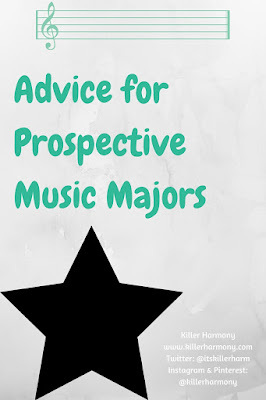 In this post, I will be dishing out some advice to the high school seniors who are planning to study music in college. This time, I get to give some advice based on my actual experience rather than what I felt my parents were doing or should be doing. I have experienced the college application process, and that means for this topic, I have a little more to say. So, here it goes. 1. Make a list of all of the schools that you will be auditioning at. This is pretty self explanatory, but the reason that I think you should do this is so that you can get organized and can keep things straight when it comes to preparing for you auditions. 2. Look up the audition requirements for your instrument at the schools you listed for #1. This is a continuation of the first tip, but you want to make sure that you are preparing good repertoire for your auditions. Most schools will want to see your range, whether that means playing pieces from different eras or different tempos, or one more technical piece followed by a lyrical selection. Most schools will require scales (chromatic, major, minor) as well as sight reading. To practice scales, I would recommend looking into getting a good scale book for you instrument. If you play flute, I would suggest ~Trevor Wye Practice Books for the Flute: Volume 5~. For sight reading, you should do a little bit of simple sight reading each day. I have found that the Rubank books are very good for this sort of thing, because they have short little exercises that you can then work on more to help your technique. 3. Contact your could-be future applied professors. Go on to the websites of the schools you are looking at, find the contact info for the person who teaches your instrument. Send them an email with your name, high school, maybe your current teacher, and line up a couple of questions to ask. This is a great way to get your foot in the door, especially if you do it before you audition there, because the professor will see your name on the schedule, and they will remember you more. Also, the name of your current private teacher (you are taking lessons, right?) is not as important if you are going out of state. If you live close to the schools you are looking at, it can be a good thing to include, because the professor at that school might know your current teacher. 4. If you are not in private lessons, start ASAP. I think that most students who are serious about majoring in music will have probably been taking private lessons for awhile, but if not that is okay. I think if you can, you should take at least a few months worth of lessons. Tell your teacher that you will be majoring in music next year and you want to get a feel for how college-level lessons work. Most private instructors were music majors themselves at one point, and they can help prepare you for the road ahead. 5. Be prepared to upgrade your instrument. If you are still using the instrument you bought in 5th grade, that is fine, but you are going to want a better instrument sooner rather than later. It can be smart to wait until the school year begins so that you can ask advice of your college professor, but just know that that expense is not far away. Also, if you play a woodwind or brass instrument, you may need to use your current instrument in marching band, and you don’t want to have to use your nicest model outside. 6. Think about the different areas of music and your interests. This will help you find the area of music that you want to focus your studies in. If you want to spend your life performing, go with performance. If you want to be a band director, you should choose music education as your major. If you want to compose, try and find a school where you can study that. Music therapy is also an emerging field not offered at many schools, but if that is something that you might enjoy, then look into ways that you can do it. I hope those six tips help you as you finalize some of your plans for the year ahead. It might seem far away, but August will be here before you know it. If you want more tips for music majors, I can write more lists. In the meantime, check out Majoring in Music. If you want to keep up with me daily, follow me on Twitter (at)itskillerharm and Instagram and Pinterest (at)killerharmony. If you want to find some sheet music, check out some of my stuff here.